Look. A mile marker. I am almost to my one year anniversary for my blog. I started it without knowing if anyone would even read it. I started it because I needed to heal, find something to do while I healed, and to lift my spirits. I started it to light my creative heart on fire, and actually create a list of all the things I wanted to do with my wonderful life. I understood I had been spared from dying and have been grateful beyond words to have another shot at living my dreams. But first I needed to heal, and I had no idea I would still be in the learning curve of how to get back into the game of life nearly 2 years after the auto accident. I'm OK with that. OK with taking care of me. OK with what I've learned from the 'gift' of an unexpected life altering change wrapped in a package called... PTSD. This is a gift I'm learning from and hopefully helping others who have PTSD heal, too. Art heals. Writing heals. Music heals. Having a good therapist (thanks Dr. Ed and Mary) helps me heal. Having supportive family & friends helps me heal. (thanks, Jake & Ash. thanks, Mommy. thanks, my dear Dylan. thanks to so many of you! I cannot list all of your names individually for fear I will omit someone special) Having a real live Superman in my life has helped me heal. Having Opie Taylor, errrr I mean Opie Wan Kenobi here at my side faithfully has helped me heal. Having met so many of you here online in the blog world has helped me heal. I started keeping track of how many people stop by about a month after I started my blog. WOW!!! And for those of you who fly by, read my blog without ever letting me know you were here. Thank you so very, very much. The numbers tell me you were here, and come back over & over to see how I'm doing. Thank you so much. I feel like you are angels popping in to bless me. 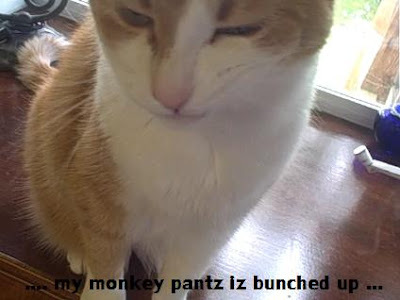 Opie has some tricks up his monkey pantz to show you, too. We are officially into the count down of the one year mile marker. Let's get this party started! Has it been a year already? It doesn't seem that long ago does it? You started your blog one month to the day after I did, we've been here on blogger together for most of that time. The seasons have changed and so have we, for the better. Keep following your dreams Lille, you have the power. I have a blogaversary coming up, too. It will make a year since I started on June 1st. I thought you'd been on much longer than I--you're such a pro! Looking forward to the party! Gee, there was a bunch of us that started about the same time! How did we all find each other in a town as big as Blogville? You are so warm and happy, I can't imagine people not wanting to visit here! Congrats Miss Lille! You have such a lovely, charming and hopeful blog. hi! i'm eleni from greece! i love your blog! it is full of joy and colours! i also love that you always carry your journal with you! me too!!!! please visit me ! i adore art journaling!!! Hi Lille, thanks for stopping by my blog. It's nice to meet you. It is amazing how fast that first year of blogging arrives. I never expected to meet so many wonderful people and for it to become such a part of my life. 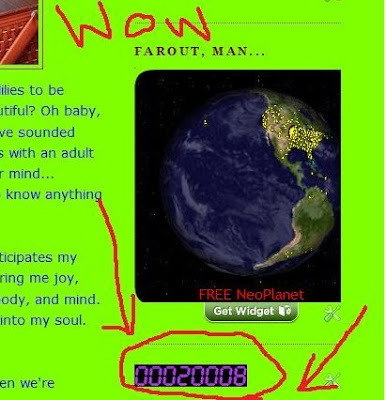 I love the bright, vibrant colors on your blog!! As you can tell from mine, I am a big fan of color!! Thank you everyone. We have so much to celebrate. Welcome new followers, and how awesome it is to have all my faithful friends here. You make waking up a joy. Thank you!!! Meanwhile we changed home, the kid is now able to talk, write and walk...thank you for your measurement of time, life and so much more. Happy Anniversary for you ! And a wonderful Sunday as well. Happy anniversary! You're way further than I was at one year! Hell, you're way further than I am at three years! 20,000 is great!!! !